Jean Genibrel, the most read karting book author in the world, has been involved in karting for nearly four decades and has sold nearly 70,000 books. He has written eight books and a multitude of magazine articles on a variety of subjects like karting, stock car racing, road racing and open wheel dirt cars. Jean was involved in all categories of auto racing and karting as a driver, engine and chassis builder, and tuner; four-stroke, two-stroke, Shifter, dirt oval and Sprint as well as in stock car, road racing, and open wheel. Jean was the editor for 'Kart Racer Magazine' and several other publications like "National Kart News", "Rod Action" and "Street Machines". All his efforts were directed at educating and assisting karters to get into karting easily and to move up the ranks effectively. Jean has helped thousands of karters become acquainted and improve in the sport of karting. As a race professional the author has gained firsthand experience with the mistakes and errors many have made in karting and other forms of racing. The knowledge was tabulated in "Sprint Karting", "The Yamaha KT100" and "Karting, a Complete Introduction". The author publishes APPLIEDSPEED.COM a technical auto racing blog and e-commerce website where his books are available to purchase. WHAT IS THE "UNFAIR ADVANTAGE"? An unfair advantage is what competitors assume you have when you are well prepared and have practiced. Marc Donohue and the Penske Team were believed to have an unfair advantage because they were winning so many races, from Trans Am to Indy cars. In his book "The Unfair Advantage" Donohue describes the team's true advantage as resting on preparation to the most minute detail, and testing before races. The book describes the need for gathering knowledge and meticulous preparation like that expressed in Jean Genibrel's books. The karting book explains some of the rules basics. 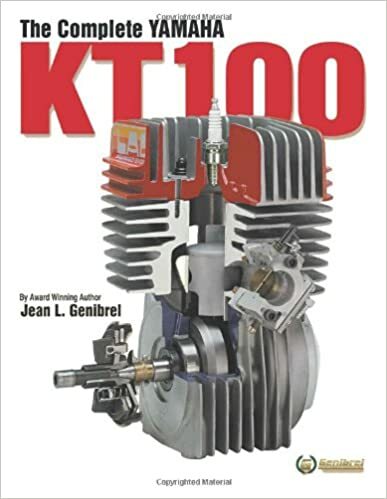 Two-stroke engines have their own specs like this KT100. Four-strokes also have very specific rules. The book does not include all the rules as they change on a yearly basis and they may vary from region to region. 'SPRINT KARTING' is an absolute must-read by any U.S. Karter in any form of go karting: Sprint, dirt oval, Shifter, speedway, asphalt, or just for those that go “fun karting”. The book takes the karter through all the fundamental information of the mechanical and technical information of kart racing to help karters move up the ranks of karting competition. From chassis set ups to carburetor tuning, to clutch adjusting to driving and much, much more. This kart racing book has it all for karters of all levels, the book is chock full of over 100 pages and nearly 400 illustrations of karting information not found anywhere else. Dozens of easy to follow lists and instructions needed to go karting competitively and economically. Unlike other karting books, 'SPRINT KARTING' is written for US kart racers. Written and printed in the U.S. for the U.S. Other books on karting are written for the UK and have no relevance to us in the "Colonies". Engine, chassis, tires, corner weights; it's all in 'SPRINT KARTING' for all ages and levels in oval, Sprint, Enduro or Shifter. For the novice and expert. For anyone involved in kart racing in the U.S.A. who wishes to get more competitive, to go faster and learn the ins-and-outs of the technology involved in the sport. Basically, anyone who is looking for information on karting, kart racing and karting technology. 'SPRINT KARTING' contains the largest amount of “how to” karting tech information for all forms of karting. The book gives the karter “The Unfair Advantage”. Passing is an art that is not learned in the first race. In this karting book, it is understood that everything that is disclosed will be practiced and used at the right time and the right place. Yes, eventually, some, perhaps, maybe… but when??? Our karting book gives the new karter a year's jump on the competition. You will learn a variety of information on your own, but I have known some karters and car racers who had ideas that were totally wrong that they carried for years to their own detriment!!! Like the guy who went his first season with his clutch set a thousand RPM too low because he listened to the wrong “guy”. Well, I figured that something was wrong when I would get smoked by newer drivers on starts. So I spoke to my engine builder and he explained how a clutch operates and he said that the clutch must be set at a precise point in the power curve. I made sure this knowledge was imparted in this book and the others I offer. I wrote 'SPRINT KARTING' with “The Progressive Learning Curve” concept, focused on the karter who is still learning (and we are all always learning). For the beginners, 'SPRINT KARTING' gives them at least a full season jump on the competition. The idea is to learn the information in a timely fashion so you can focus on the task at hand before you progress to another learning experience to build on what you have learned earlier. Karters often learn incorrect information or they have to learn from experience which can lead to a lot of pitfalls, mistakes and wasted time. WHY DO I NEED TO LEARN THE FUNDAMENTALS BEFORE THE “TRICKS AND SECRETS” OF KARTING? There are no such things as “tricks and secrets” in racing. There are only things you do not know. 'SPRINT KARTING' was written to impart the fundamentals and then faster times will come. Practice, learn the “why” of things like why to set the carburetor or the clutch a certain way, and so on. There are many things to check on Sprint and Oval chassis. Knowing what those settings are can make the difference of several finish positions. Many set ups are the same with Shifters, oval and Sprint karts, like with checking tire diameters. You do not need stagger in Sprint but then again you need to measure the tires so you can be sure no stagger is present. Trying to set fast times before learning the track and the basics of race driving and the discipline involved (see pages 4, 62), trying to hold a position before learning the basics of race driving (page 66), setting the clutch by what the “guy next to me” said (chap 8), trying “trick” settings before knowing the basics (page 49), trying to learn the “secrets” (that do not exist), buying or trying unnecessary parts like with changing the gear unnecessarily (page 52) “tweaking” the carburetor (chap 5); trying different tires, axles, engine builders…and on and on. Shifter brakes need special attention. These karts have front and rear brakes and they need to be balanced properly to avoid wheel lock. The balance bar requires special adjustment to apply pressure directly on the pistons to avoid damage to the cylinders and to produce the proper balance between the front and rear brakes. Tech inspectors get really picky at big races. They often will tear down engines to make sure they are legal for the class you are running. Most clubs run under the IKF or WKA rules but beware of "local rules" that may differ somewhat from the national ones. The right engine builder like L.A.D Specialties in Bridgeview, Illinois, can make the difference from being an also-ran and a National WKA Daytona Week Champion. Once you find a good shop stick with them and do not hop around from place to place. Sean Burr, Go Racing Magazine Photo. Shifter karts are like little Formula Ones. They have better power to weight ratio than F1 cars. These are the training ground of many Indy Car and Formula One drivers. New karters are well advised to get some experience in slower, more easily manageable machines than these wild-haired monsters. Here these ole' boys are starting the shifter engine by twisting the rear wheels. Brothers Tony, Frank and Cruz Pedregon had their beginnings in dirt oval karting at Ascot Park in Gardena California. The trio learned the basics from Jean Genibrel's first karting book in 1984. Tony went on to win his very first Sprint kart race, which turned out to be a National Championship race. Of course, the brothers went on to an illustrious career in professional drag racing. GET FREE PISTON LOCATION vs PIN OFFSET XL CALCULATOR WITH PURCHASE OF ANY OF THE BOOKS. What 'SPRINT KARTING' is not, is a book on fun karts, or go-kart plans, or fun karts to "just drive around a parking lot" (which is illegal and dangerous!). Karting should be practiced at supervised, purpose-built tracks and never on public areas. If you are interested in getting into kart racing buy a copy of "KARTING a COMPLETE INTRODUCTION' and learn how to go karting safely, economically and have more fun at it. Images seen here may differ from those in the books.